ADCO makes the countries' most popular Class A RV Cover. Not only does ADCO manufacture a product that’s tried and true, it’s also one of the most economical options. Covers start at $285.30 and each cover comes with a 2 year warranty. The oldest protective cover company in North America, ADCO has tons of experience designing and manufacturing covers. They are a family owned company that has sold nearly 20 million covers to date! 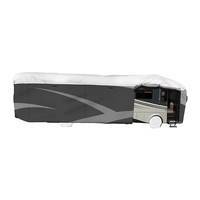 Choose an ADCO Class A RV Cover today to protect your investment and preserve its resale value. The best way to choose the correct size cover is to measure your unit. You should measure your units overall length including everything you want covered. Going by RV manufacturers specs can often result in choosing a cover which is not long enough, as the manufacturers do not always include bumpers, etc.